The story in this film is quite interesting as it mixes in sports drama with the macabre themes of the undead and that ironically adds some freshness to the two genres that have been done to death. The story in this film is easy to follow and you won't find yourself confused at all and that's good as this isn't a short film. I did find that the writing towards the end of the film was trying way to hard to flesh out the story, this was very unnecessary as we already had all of the details we needed from the story and characters. The drama is good but not great but it does draw you into the film and keeps you interested in the film. This film does also include some neat twists and those said twists do help make for stronger moments in this film and they were also unexpected to boot. The horror part is also good, not great but it does have an interesting approach to the zombie genre and I gotta give the director an A for effort for trying to do something new with the undead. The drama and horror helps give this film a serious atmosphere but this film also has comedy thrown in. The comedic moments were pretty funny and did make me laugh but this film isn't choc-a-block full of comedy, that's a good thing because too much comedy will just make you think this film is more goofy than serious. Not all scenes are serious as there is a lot of cheese to be found as well and I found the mixture of matureness and cheese to be very even and thus making for mature cheese. This film is actually a two part mini-series with each part going for an hour each. I do like the names of the parts as they mimic the terms found in actual football/soccer matches, half one and half two. My problem with the movie is that it goes on for way longer than what it should've gone for as it had some scenes that dragged on for so long to where the film was getting a bit tiring to watch and does hurt the rewatch value. 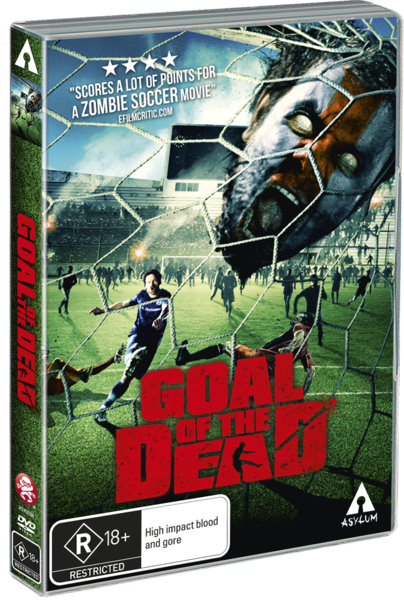 What would've been nice is that the film was made up of two forty-five minute halves as it would not only have the boring stuff cut out, it would also be the actual time that the average football/soccer game runs for, I guess I can count the action scenes as injury time. The zombie make-up looks very cool, it makes the zombies look very menacing due to how grueling and dead they look. What makes the zombies menacing is the special effects that they added to them including the froth around their mouths and how they spew the froth out. The spewing effects did look cool at first but they do like to run the same effect to the ground and you will get sick of it (no pun intended). The zombie spewing effect is toned down for the second half of the film in favor for a more traditional moaning, groaning zombie, and that works much, much better. Speaking of effects, I liked the dismemberment effects as it was fun seeing zombies getting the stuffing beaten out of them and it looked very cool. Some of the kills in this film can be pretty violent as they were very brutal and not to mention, gory as well. The acting in this film is all in French and so the only way you can watch this film is with English subtitles on... Unless you know French. The acting itself was decent as it made the characters very believable but it is also something that won't win any awards for being the greatest acting ever but it didn't need to be, it suited the B-film vibe very well. While decent, also expect some cheese from some of the minor characters. I did find one scene where the acting was a bit awkward as you have a scene where one very serious character is acting in a non-serious way, it didn't work very well. The acting of the zombies was also decent as all the actors got into the zombie vibe well and pulled it off well. The special features section on this release is small but effective as you get two short films and a trailers for the movie. The first of the short films is about a tale of revenge and food. The second of the short films is about an Australian tourist going to France but finding nothing but trouble. Both short films were very funny, very entertaining, and very enjoyable and especially if you are a fan of movie releases from Troma (Toxic Avenger (1980), Class of Nuke 'em High (1986)) as they share that same ballsy over the top comedic gory charm. The short films were actually done in a style to where they were fake movie trailers and it would've been genius if they were spliced into the movie in between part one and part two, it would've gone well with the grind house nature of the film and made for a great halftime show. The actual trailers for the film were okay but I didn't really have any feelings towards them. The two trailers are to promote the first part of the film and the second part of the film and they were pretty straight forward telling you what the film was about. I did think that the first trailer did give a bit too much away but this was also the case where it didn't look like that it had any choice but to give away some spoilers, thank goodness it didn't give away the biggest plot twist found in the movie (I'm not going to give it away either). Overall, this film is worth a watch but as a rental and is also best watched with a bunch of friends, a bunch of beer, and a bunch of other horror flicks to watch in a marathon along with this one. The main reason why this is recommended as a rental is due to the second half of the film and how it had scenes that dragged on for much longer than it should've been. Good, not great.